Google has its own quirky ways to celebrate upcoming events. I mean who can forget the new PUBG inspired Santa mini-game which Google released just before the Christmas holiday, or the labyrinthian puzzle it set for the Google I/O announcement. Although the California-based search giant is not pulling out all stops for Valentine’s Day, it is launching a new themed movies features for Google Photos, which should delight many of the users. The new feature uses Google’s artificial intelligence to automatically create themed movies for you from your pictures and videos. 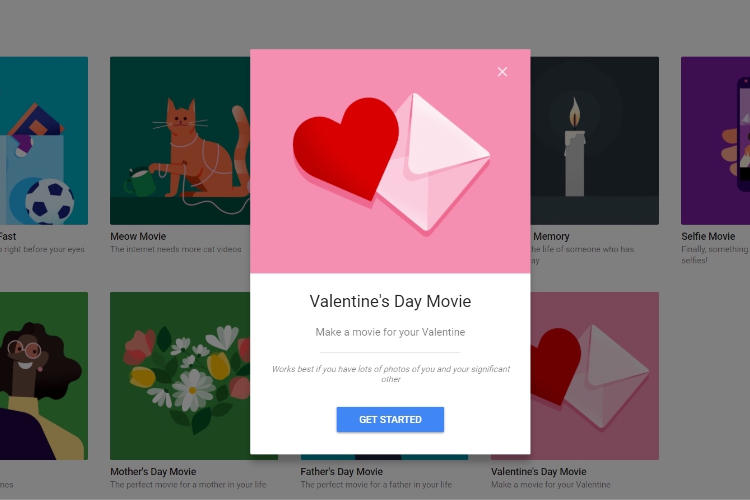 Although Google has launched this feature to coincide with the Valentine’s Day and features a Valentine’s Day specific theme, there are also a number of other themes to choose from. The themes include, They Grow Up So Fast for kids, Meow Movie for cats, Doggie Movie for dogs, Selfie Movie for all your selfies and a few more. Creating a movie is also as simple as it can get. Just launch the Google Photos app on your phone or on the web and click on the Assistant tab. Here, click on the “Movie” option and choose your theme. After choosing your theme hit the Create Movie button and Google will automatically select the photos which are best suited for your selected theme. It will even add a suitable background music for you. Depending on how many photos Google chooses for your movie, it may take anywhere between a few seconds to a few minutes to complete your movie. Once your movie is done, you will receive a notification from your Google Photos app where you can view, download, and share the movie. In my testing the movies that Google created were nothing extraordinary but they were also not bad. I love the fact that its artificial intelligence was good enough to select the right photos. The background music was also pretty good, but, I didn’t particularly like the animations that it used to convert my pictures into a movie. That said, it’s a really easy way to create and share movies without you having to literally do anything other than hitting a button.